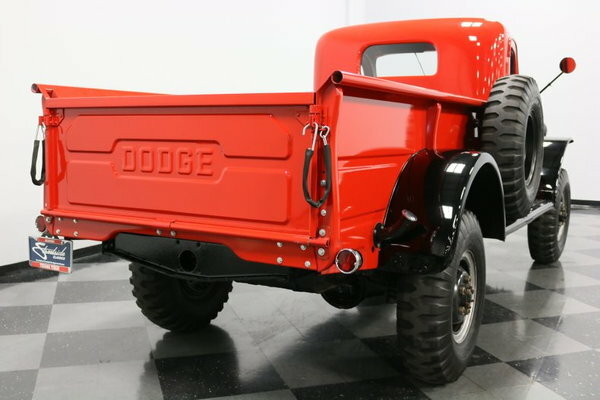 If you haven't been paying attention, the Dodge Power Wagon is a pretty big deal these days. 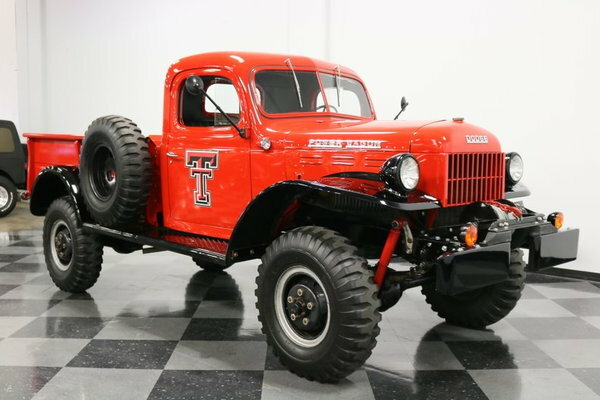 Trucks like this 1952 Power Wagon pickup are no longer $10,000 beaters and my professional opinion is that we'll see them comfortably knocking on the door of $100,000 very soon. 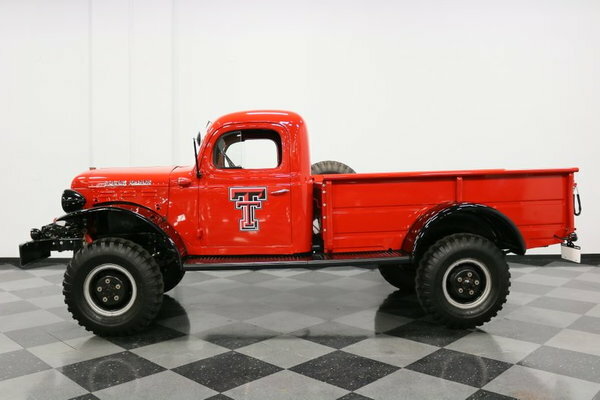 So, if you've been considering one, don't keep shopping, buy today because they're already showing a strong investment return and will not be getting more affordable in the future. 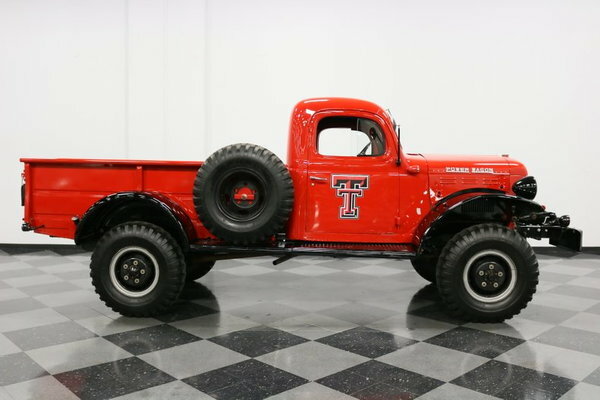 The sleek red and black paint on this particular Power Wagon is better applied than it would've been in 1952, but it has a purposeful look that suits it just fine. 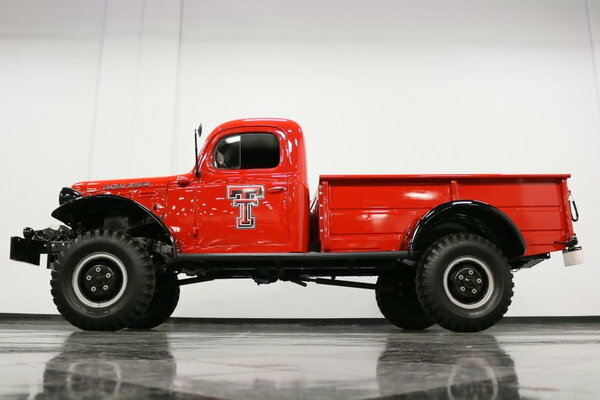 It was refinished by a couple of skilled brothers to honor their alma mater and haul the family around town and still looks great today, with just the right blend of shine and utility that means you can still use this truck as, you know, a truck. 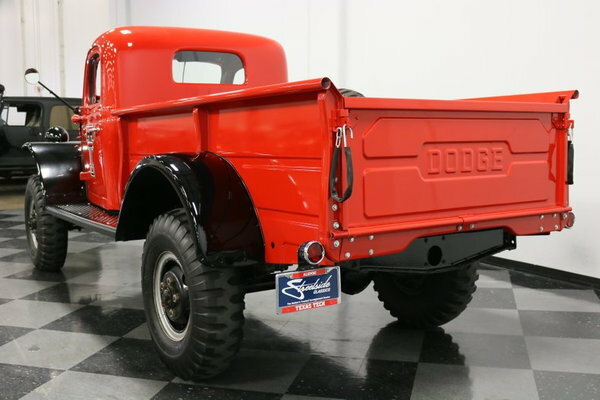 Given the straightness of the bodywork, there's quite a bit of time invested in the restoration and there are Power Wagon fans who will say that the later beds like this one wears are the more attractive choice. 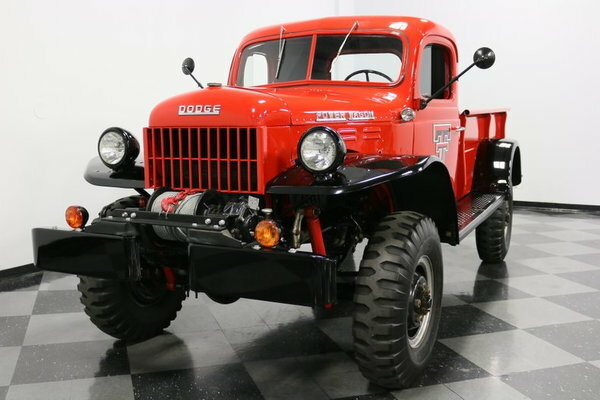 The burly, utilitarian look is surely a big part of the Power Wagon's appeal and it didn't evolve much from 1946 to 1967 when it was finally replaced by a newer design, and that's surely why they're so popular today. 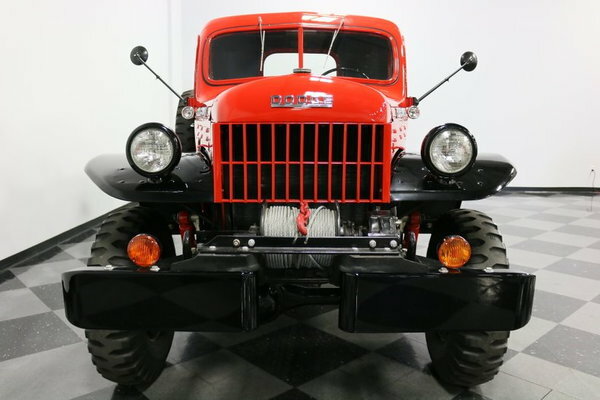 The separate fenders, free-standing headlights, and a bumper (featuring a giant Braden winch) that looks like it could push over a prison wall all make this the manliest truck ever built. 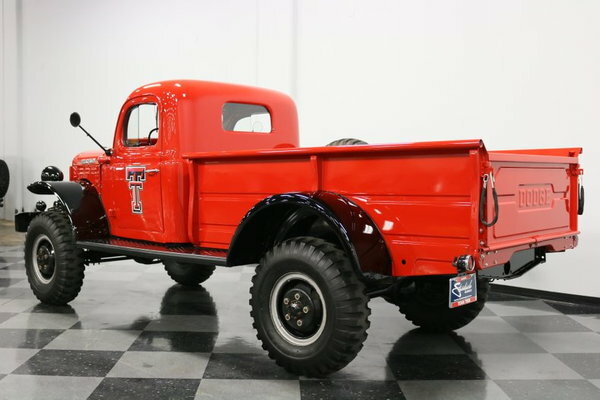 The bed was still wood in 1952 and this one has been finished to such a nice standard that you'll make your fellow tailgaters clean off their gear before they throw it in the back. 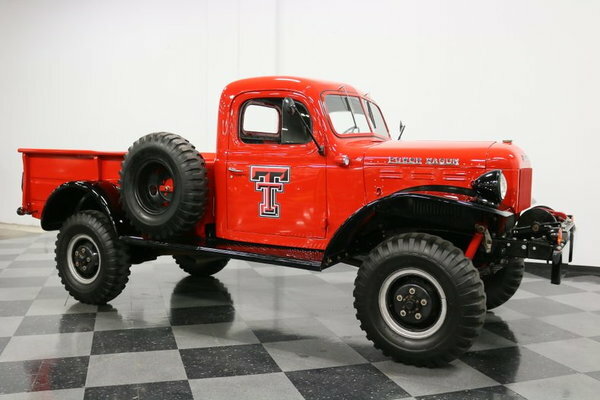 And yes, a professional could neatly remove the Texas Tech decals if you aren't a fan of the Red Raiders. 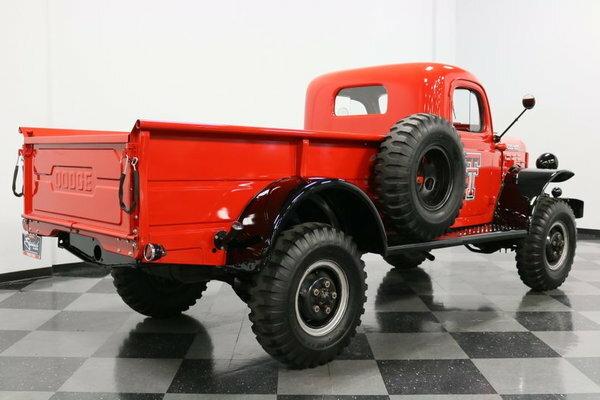 The cabin is basic, yes, but the functionality is just what you'd need from a tool like the Power Wagon. 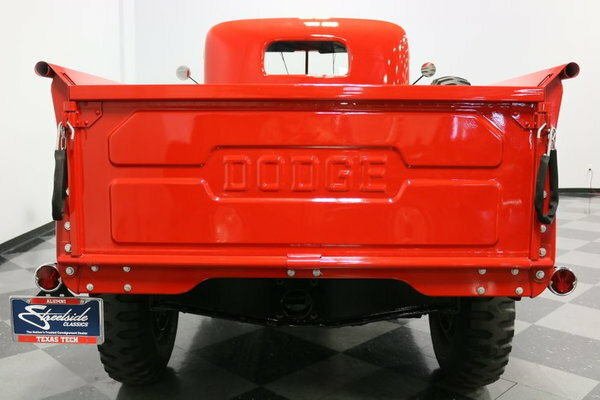 A custom embossed red and black vinyl bench is nicer than what you got when it was new and it's in excellent shape. 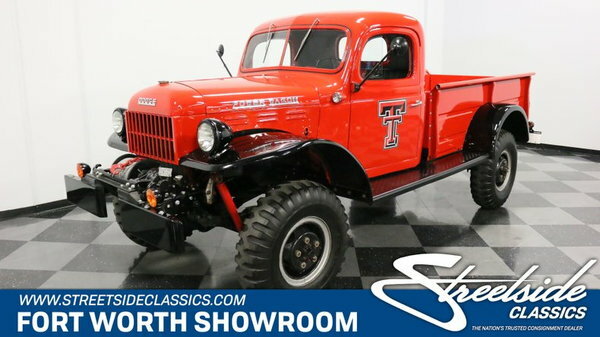 Plain door panels and vinyl headliner were standard equipment and the giant, original steering wheel is mandatory for managing this beast of a truck in traffic. 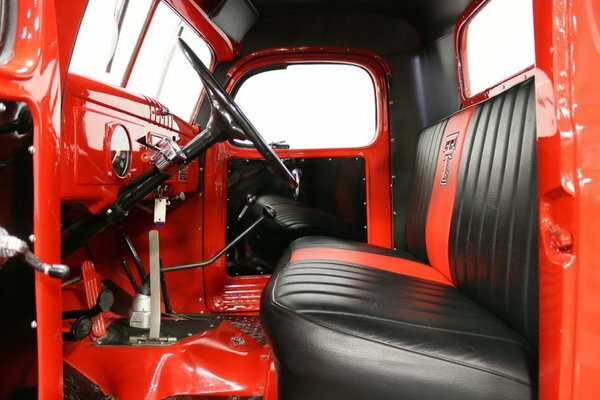 The gauges are in great shape and consist of a big speedometer in front of the driver and auxiliary gauges in the center of the dash. There is no radio, of course, but the sounds of a long-gone era is all you should need inside this beautiful cabin. 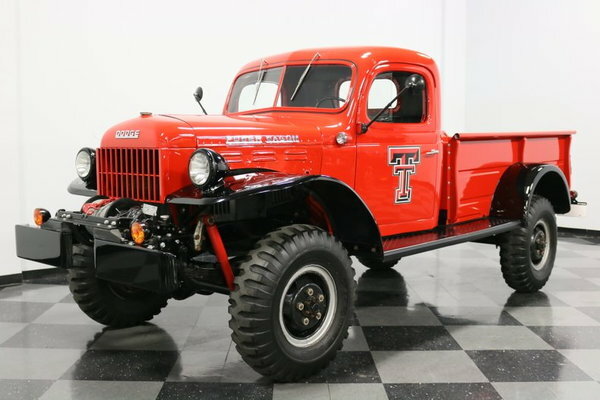 The array of levers on the transmission tunnel control the 4-speed manual gearbox, 2-speed transfer case, and power take-off, which is one of the Power Wagon's most useful features. 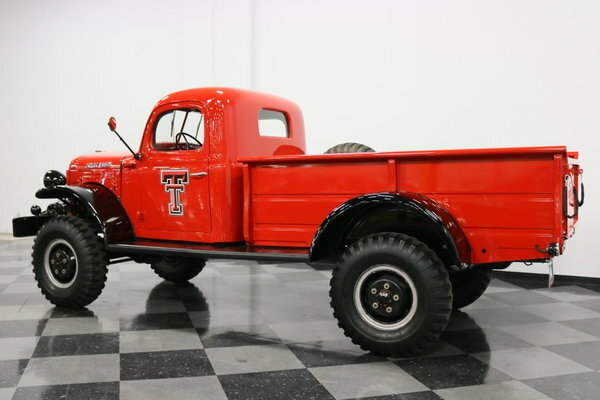 Black accents in the floor panels give it a finished appearance, tying together a truly impressive interior. 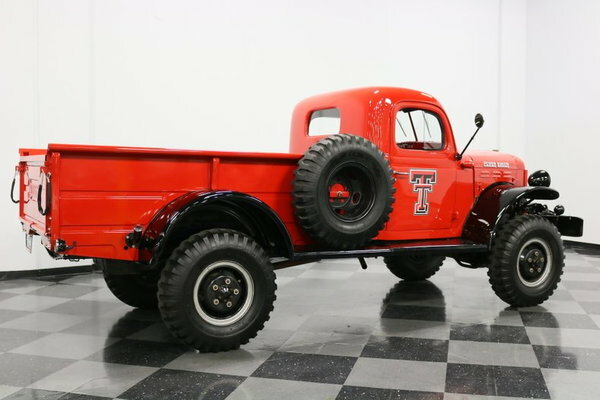 The 230 cubic inch inline-six seems modest in specification, but with proper gearing, it moves this big truck and a full load without working too hard. 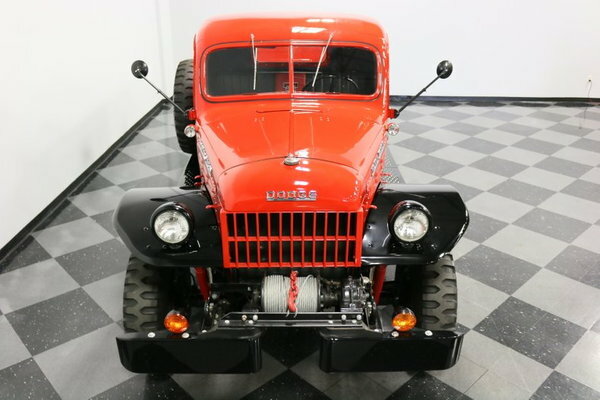 It's fantastically over-built, designed to idle for hours and to drive that PTO without getting hot, and despite being in a truck, it's remarkably smooth. 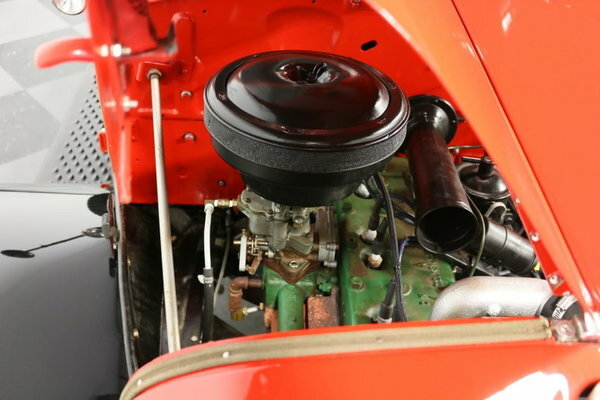 It looks correct under the hood with green paint on the block, a downdraft carburetor, and factory exhaust manifolds, so it's working as intended. 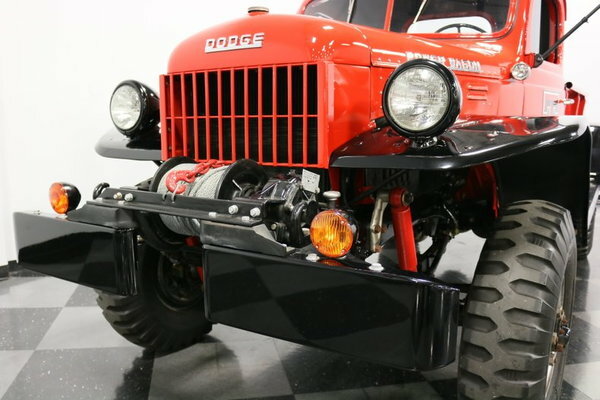 There are plenty of signs of maintenance and an upgrade to an alternator and Painless wiring harness certainly helps keep the electrical system charged and ready for battle. 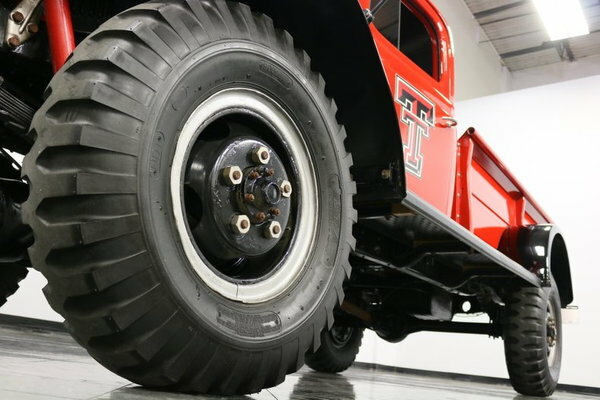 The 4-speed manual transmission wasn't synchromeshed until 1957, so it takes a few rounds to get accustomed to cleanly shifting, but once you do it's a pleasure to drive. 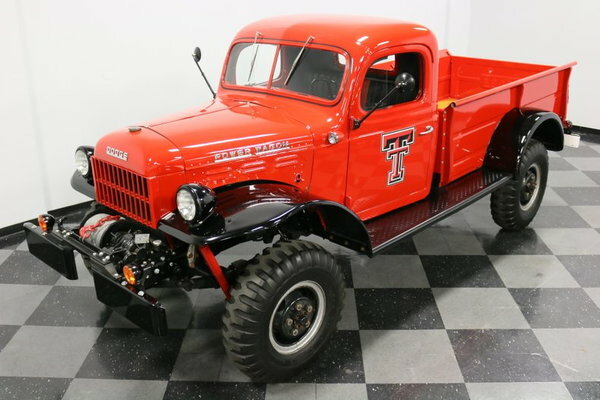 And if this truck can't get you where you're going with its 4-wheel-drive system, then you probably didn't want to go there anyway. 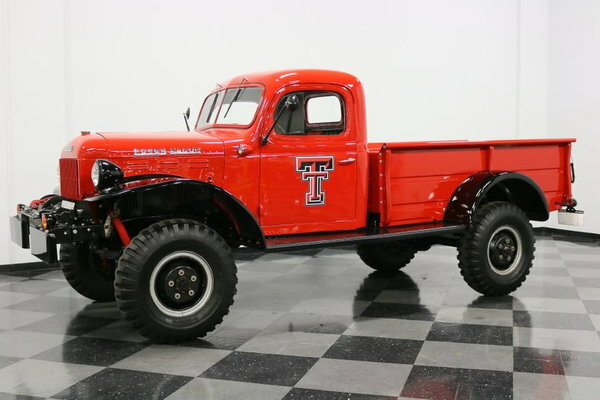 It's tidy underneath with no signs of off-roading abuse, and those heavy-duty steel wheels with gigantic 9.00-16LT bias-ply tires look fantastic. 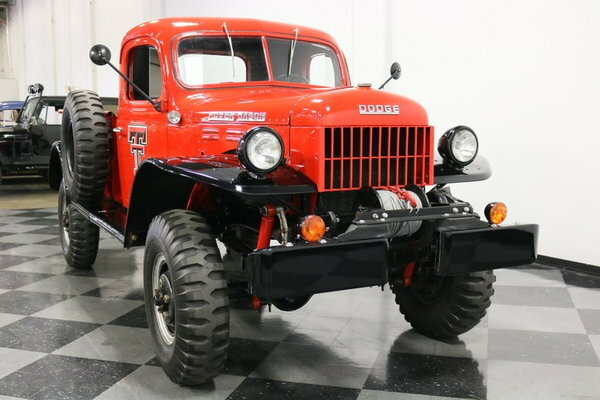 Power Wagons are red hot right now, and if you were hoping to get one cheap, well, even projects are $15,000 these days and fully restored trucks can command big $. 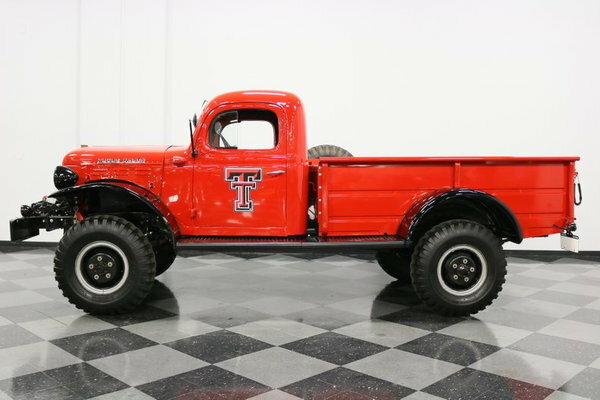 This one is finished and ready to rock, all for a fraction of the price it would take to restore one from scratch. Call today!